With unanimous votes of approval from the Sarasota City and County commissions, $631,513 in federal Community Development Block Grant (CDBG) funds will be available for improvements on Myrtle Street that city and county leaders have sought for many years. 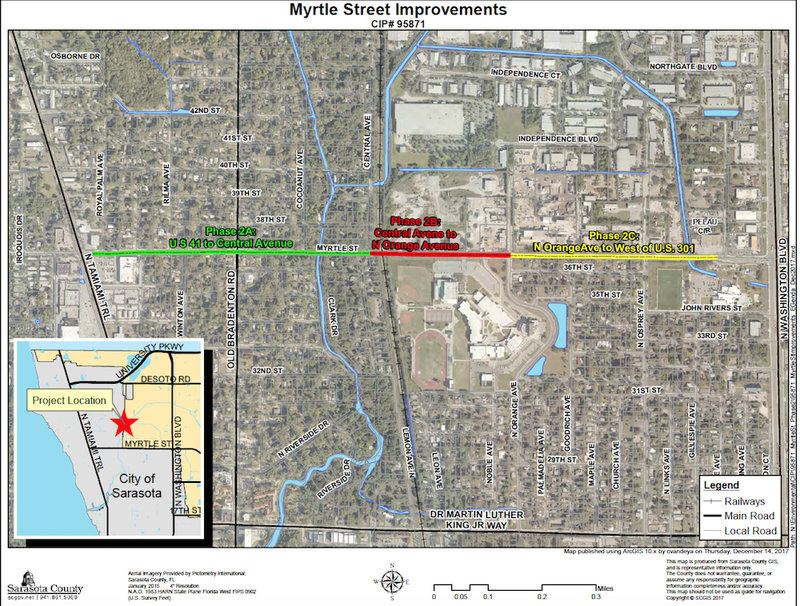 Another $1,109,401 in CDBG money will be allocated to the Myrtle Street project if no public objections arise to a proposed amendment to the “Action Plan” for the 2017 and 2018 fiscal years that the city and county jointly approve, a Feb. 13 county memo explained. The city and county collaborate on the CDBG program and other federally funded measures to assist low-income people and the homeless with housing needs. As a result, according to federal law, no amendment to the Action Plan can take place without the advertisement of the proposed modification and then the opportunity for public comments during a hearing, the memo added. The County Commission will review the proposed amendment during a session in April or May, the Feb. 13 memo said. 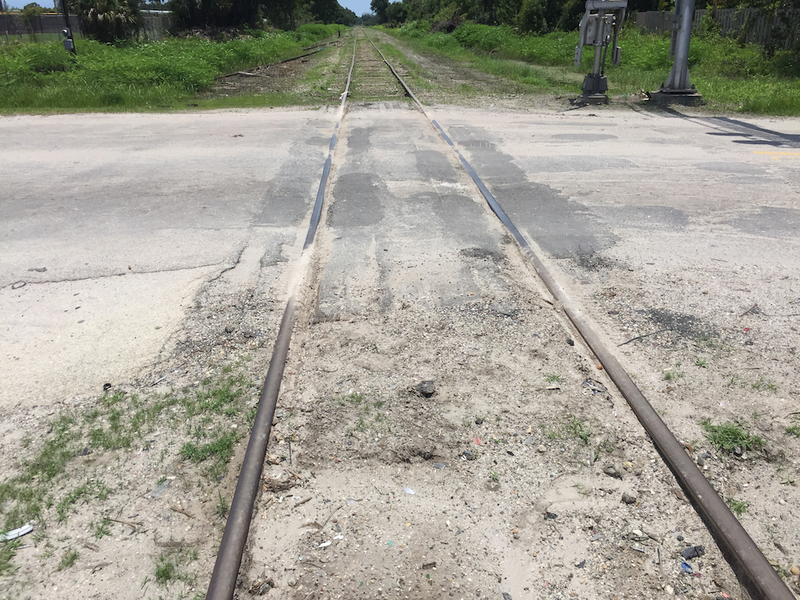 If the board approves the revision, and county staff finally can achieve success in years-long negotiations with the Seminole Gulf Railway — which owns the railroad tracks along Myrtle Street — then the design of improvements to Myrtle between Central Avenue and Orange Avenue would begin in July, the memo pointed out. The completion of construction would be expected by the end of 2021, the memo said. The County Commission approved the agreement for the $631,513 during its regular meeting on Feb. 13. The City Commission followed suit during its regular meeting on Feb. 19. 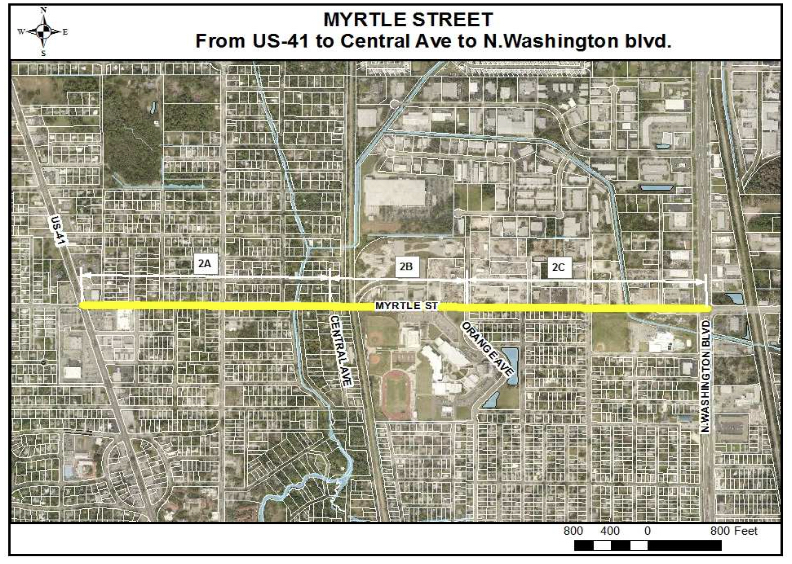 If the talks with Seminole Gulf representatives do not reach a successful conclusion, the county memo explained, then improvements on the north side of Myrtle Street between Tamiami Trail and Central Avenue would be completed. The county memo — with information from Don Hadsell, director of the Office of Housing and Community Development in Sarasota — explained that on April 17, 2012, the City and County commissions held a joint meeting. Among the items for discussion that day was what was called the “Myrtle Street Improvement Project.” It included the widening of Myrtle Street, the construction of sidewalks on the north and south sides of the road, drainage improvements and the addition of bicycle lanes and lighting on Myrtle from the U.S. 41 intersection to approximately 200 feet east of Osprey Avenue. The project has been taking place in three phases, the memo continued. The south side of the segment from Tamiami Trail to Central Avenue has been completed, but the work on the north side remains unfunded. The latest estimate for that expense is $1.1 million, the memo said. Although the county has allocated $4.1 million to the section from Central Avenue to Orange Avenue, the memo pointed out, “To date, the County has been unable to finalize an agreement with the [Seminole Gulf Railway] to purchase easements and construct improvements within the railroad right of way. It is anticipated that an agreement will be reached with the railroad that will be brought to the [County Commission] in April 2019. In a Jan. 28 email to Deputy City Manager Marlon Brown, Hadsell wrote that he and Cindy Emshoff, who has been managing the Myrtle Street project through his office, participated in a conference call that day with County Engineer Spencer Anderson and Thai Tran, operation manager in the county’s Public Works Department. Finally, the Feb. 13 county memo noted, the intersection at Washington Boulevard and Myrtle Street has been improved as part of the planned work between Orange Avenue and Washington Boulevard. Funding is in place, the memo continued, to complete the remainder of that phase, which is under design. The anticipation is that that part of the project will be put out for bid in the fall, with construction set for completion in 2020, the memo added. As for the Action Plan amendment: The Feb. 13 memo explained that in 2017, the City Commission approved a report produced by staff of the Florida Housing Coalition, which the city had sought. The report focused on effective responses to homelessness in the community. Among the recommendations were that the city and county in the following year create a minimum of 20 permanent housing units across the county, where homeless people could live and receive social services support in an effort to help them remain off the street, the memo pointed out. The overall goal, the memo said, was for the city and county to create 40 such housing units in the community. As a result, the city allocated $596,513 in its CDBG money to the project, while the county set aside $1,109,401 of its funds for that purpose. Additionally, both local government bodies “agreed to use $500,000 in State Housing Incentive Partnership (SHIP) funding to create Permanent Supportive Housing Units,” the memo said. As a result, the memo continued, the $1,109,401 in county CDBG funds are not needed for permanent supported housing units at this time. Therefore, staff recommended the money be reallocated to the Myrtle Street project. During the Feb. 19 City Commission meeting discussion about the agreement with the county for the Myrtle Street funding, Commissioner Willie Shaw pointed out to Hadsell of the Housing and Community Development Office that, along with complaints over the years about the “roughness of the [railroad] track [on Myrtle],” drainage problems had caused much concern. Homes on Central Avenue, especially, Shaw said, had suffered because of the situation. 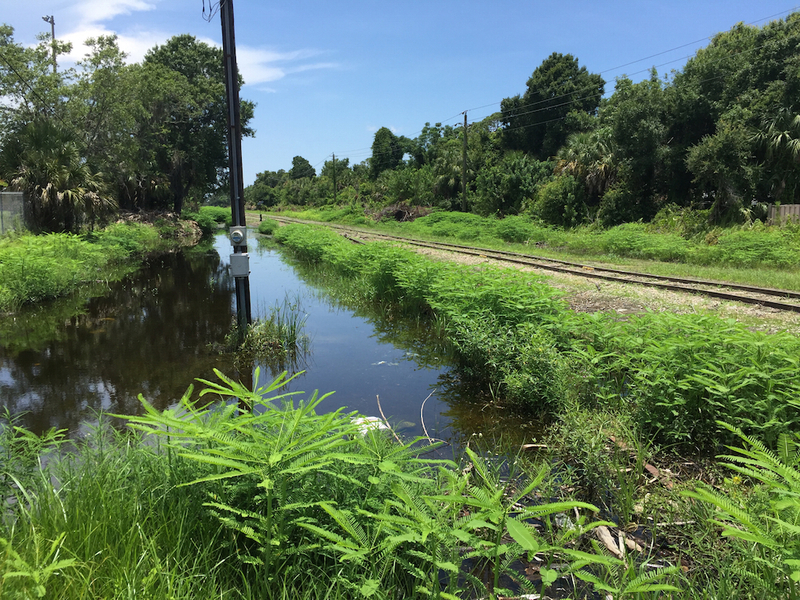 Would Seminole Gulf Railway address the drainage issues, Shaw asked. “That’s all being factored in and worked on,” Hadsell replied. Nonetheless, Emshoff, manager of the Myrtle Street project through Hadsell’s office, emailed County Engineer Anderson after the City Commission discussion to seek more details from Anderson on Shaw’s behalf. In a Feb. 19 email response, Anderson told her that new infrastructure is being installed under the railroad bed, which will handle the flow of stormwater from south to north. “This is expected to resolve the non-structural flooding issues being experienced south of the [railroad line],” Anderson added.